One must strive to be sincere when learning and reciting the Qur’aan. 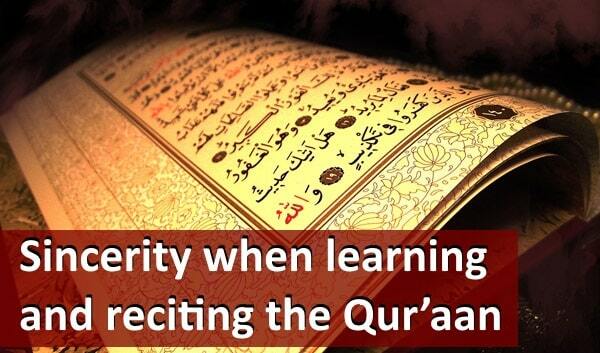 Both learning and reciting the Quran are acts of worship for which one is only seeking Allah’s pleasure and reward. The validity of any act of worship is that the following two conditions are fulfilled: sincerity and Mutaaba`ah (following the Prophet in the way one performs the act of worship). Intention is not merely the statement of the tongue nor is it simply a thought on the mind, rather it is the motivating force in the heart to perform a deed solely for the sake of the Almighty. Sincerity to Allāh’s Book comprises of believing in what the Qur’aan tells us and harbouring no reservations about what it says. We must know that the Quran is Allāh’s word that was revealed to Muhammad pbhu Submitting to the commandments found in the Qur’aan and living by its teachings is also an integral part of being sincere to Allāh’s Book. We must believe that the laws enumerated in the Quran are the best of laws that can never be rivalled by man-made laws. Another aspect of this sincerity is to come to the defence of the Qur’aan from those who would aspire to corrupt, abuse, and misinterpret it with their tongues. Allāh has taken the preservation of the Qur’aan upon Himself. However, this does not mean that people will not try to misrepresent it and corrupt how people approach it and understand it.